In this post,I will get some information about Distribution Points and content locations when you Distribute Packages and what happens and Tips . 1.How to set Drive Settings when installing Sec site DP role ? 2.How to avoid selecting the most disk space drive as Content location(DP) ? 3.How to check what are the next available Drives for Content location ? 4.How to remove DP role,Verify it is removed and reinstall the Role ? 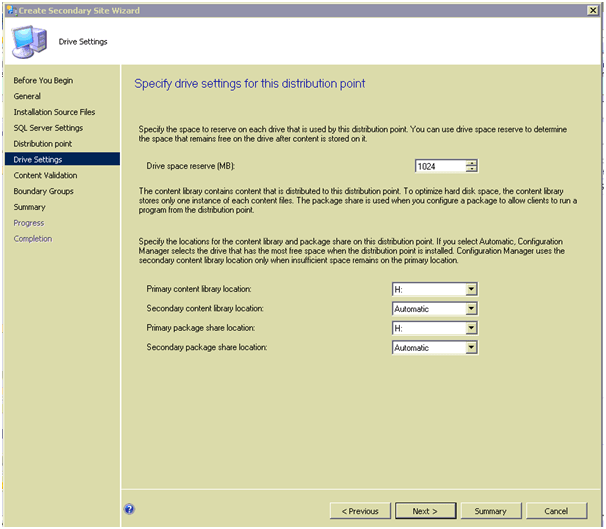 when you install SCCM 2012 Secondary Site from primary ,Management point and Distribution Point roles will be added by Default and you choose the settings in installation Process. When you are at Drive Settings for the Distribution Point Role,you need to cautious in choosing the drive letters for Content library location and package share location as primary and secondary because you can not change them at later stages AFAIK. Below is the screen shot what am talking about you see when installing secondary Site. 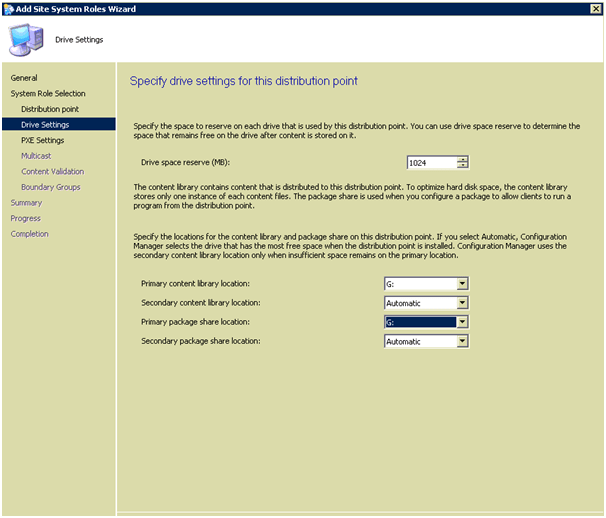 Drive space reserve (MB): The Disk space reserved(MB) you configure determines the amount of free space on a drive before Configuration Manager 2012 chooses a different drive and continues the copy process to that drive. Content files can span multiple drives.If the current DP drive free space reaches 1024,it choose another drive(Max Disk space) as DP drive. This reserve space is applicable to both Content library and package share location. 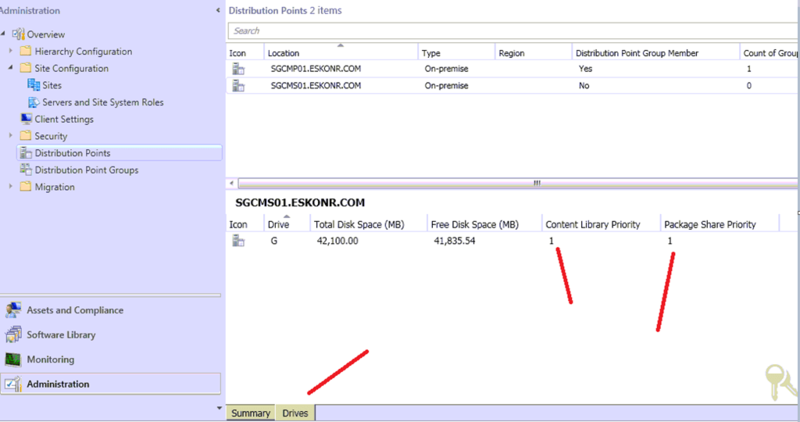 Primary/Secondary Content Library Location: SCCM 2012 will copy the content to Primary content location (First Priority) until the amount of free space reaches the value specified for Drive space reserve (MB). By default the content locations are set to Automatic and the primary content location will be set to the disk drive that has the most disk space at installation and the secondary location assigned the disk drive that has the second most free disk space. Note : To Avoid selecting the most disk space drive as Content location,Place NO_SMS_ON_DRIVE.SMS in the root of drive. When the primary and secondary drives reach the drive space reserve, Configuration Manager will select another available drive with the most free disk space and continue the copy process. If you specify the Drive location and later if you want to change,You will have to remove the DP role and Install it. How to check what are the Drives that available to be configured(selected) as Next Content Locations ? go to administration Node—>Distribution Points—>click on secondary Site. On the bottom ,you see drives wit list available and their priority. If you see any other drives which u don’t want to be here,place NO_SMS_ON_DRIVE.SMS in the root of the drive. “Cannot create SCCMCOntentLib” on H drive Error:67,Network Path Not found. I looked at secondary Site Registry if I can remove the H drive to make it work .Below are the registry settings path where you see the above selected settings. In my Case,server selected H (Primary) ,G(Secondary),E(Next Secondary) drive for DP. removal of Drive and restart DP Component manager did not solve the issue. Either Add missing Drive to copy the content or Remove the DP role and install it to get the drive settings Option. How to check DP role is removed or not ? 2)Go to administration node—Distribution Points—>Secondary site. In the drive tab,you see no drives available. I added the DP role for the secondary Site system and get option to select the content library /Package library locations. When my G Drive is free space reached 1024MB,it chooses nextmost disk space available (In this case,I have only this drive as DP). as you see,my Primary content library and Package share locations are G drive. This time,packages went well with No Issues. 2 Responses to "#SCCM / #Configmgr 2012 DP Error Failed to Create Share SCCMContentLib$ Error=2116"
I'm having these strange problems sending packages to distribution points. Cannot create \\SCCM01.domain.com\V$\SCCMContentLib, [error code: 67, error message: The network name cannot be found.]. Cannot create the content library storage directory \\SCCM01.domain.com\V$\SCCMContentLib, use the default directory. 1) SCCM01 is our CAS, will it remove everything we have distributed to it? 2) Will we have to re-redistribute all the packages, applications...etc, to that DP again?